Mr. Miner's Phish Thoughts » Blog Archive » Ticket Paranoia! Staring at the glowing screen with sweaty palms as your heart palpitates; refreshing the screen every second waiting to see that magical “Buy Tickets” button; constantly glancing at the time, moving as slow as Elmer’s glue; it’s all back. 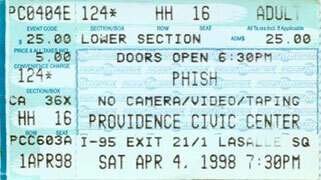 This ritualistic stress has returned as we sit on the brink of Phish’s first ticket on-sale weekend in five years. This time, it’s not just three shows, but an eleven show run over two days. The nerves always become a bit tense in the 24 hours leading up to the moment, as you try to devise the perfect strategy to succeed. Maybe you should open three windows at once? Maybe you should drive a few states away to a random outlet and score in person? Maybe you should try to keep the agent on the phone for the right amount of time? Maybe you should go into work early on a Saturday morning to use their fast Internet connection on multiple computers? Maybe you should split up the shows with your friends and all try for a separate one? The options are endless, and the irony is that there is no clear cut “best way” to score tickets in this age. This fact makes the game all the more fun to play! Ticket paranoia- it can be paralyzing! As you lie in bed the night before or sit at work waiting for the few hours to pass, your mind can become numb. All of a sudden, you find yourself unable to perform any tasks other than refreshing the browser and your mind becomes obsessively one-tracked. Thinking about, let alone accomplishing, anything else can sometimes be straight up impossible. Maybe that’s where you’re at right now. As the time approaches, the butterflies flutter a bit faster while your heart rate begins to steadily increase as if you were exercising. Refresh. The clock says 9:57. 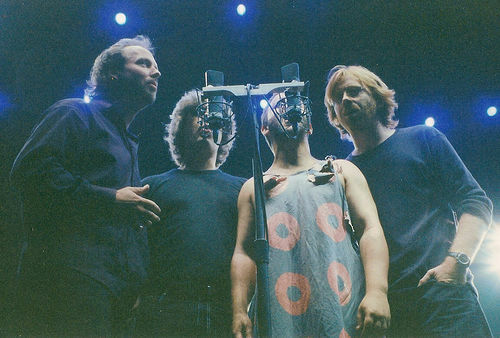 Thoughts of Phish, the joys of summer, the warm air in the amphitheatre, the first set under the fading sun, the long carefree drives. The clock still says 9:57. Damn! Refresh. This type of pattern continues for the next three minutes- however it seems like three hours- before that :59 finally turns to :00. 10:00. Now the adrenaline kicks in, as you try your best to control your mouse-clicking finger, making sure you do things briskly, yet carefully. At this point, your nerves and adrenaline can actually work against your fine motor skills; your body becomes momentarily discombobulated. But you push through, overcoming as you must. Damn! You can’t read that security word- “Why the hell do they make them so hard to read?” you wonder. You ask for another code word, thinking that this step could be your demise, or mean the difference between a great seat or a lawn seat. Quickly you type in “design” and “snowbank” as quickly as possible while wondering how the hell they choose these random words. You finally click “Enter.” Your waiting time is less than 2 minutes. Two minutes!! You begin cursing in your mind, letting one or two leak out of your mouth. That wheel is spinning forever! Around and around and around and around, then all of a sudden your wait time jumps down to “less than a minute.” “Let’s go, let’s go, let’s GO!”, you think to yourself, waiting for that ticket page to appear. YES!! Like a shaft of light shining on you from above, time stands still as the next screen appears -“Section 103, Row G, Seats 23, 24.” Booyakasha! A hundred pound weight lifted off of your head, and your anxiety turns to momentary glory. There is no time to rest, you have one minute and thirty seconds to complete a couple more steps. Payment. Since we haven’t ordered tickets in years, maybe you no longer have your credit card number memorized, so you lay it beside your keyboard. Looking back and forth between every four numbers, you carefully type in the digits. Then the expiration. Then the code. Finally, the shipping. You know this info by heart and you breeze through, recheck it all and submit your order. Finally, you can relax. But this time there is no time to rest with seven shows going on sale! Then four Saturday morning. You’ve got to get your nose directly back to the cyber-grindstone and go for the gold. Today, all of this will take place on foreign territory- Live Nation. For years, fans have cursed Ticketmaster for any and every reason, but we all got very used to their website. We no longer needed to look for anything on the screen. This time through, with a poor user interface, your guess is as good as mine as to how this will turn out. Live Nation may crash and error out orders with the high demand for all we know- even Ticketmaster did that sometimes. But with all the different shows going on sale at the same time, the demand will hopefully be dispersed enough to ensure that many people can hook up some stubs. With the likely ability to only score a couple of shows, I foresee a lot more online ticket trading before the beginning of June. In the end, if you passionately want to go to any of the shows this summer, besides Asheville and The Fox, your will will get you in. Just don’t give up, and for God’s sake, don’t stay home because you don’t have a ticket! This may be against Phish’s “advised polices,” but if you haven’t found a ticket yet, and you really want one bad enough, you will find one on the lot. Just get there early enough and scour like a madman! Don’t stand like a statue with your finger in the air. It simply comes down to desire. Best of luck to all in the newest version of the ticket game; this is only the beginning! Share today’s ticket stories in Comments! Due to all of yesterday’s talk around this epic show, it has jumped to the top of the pile for today’s download. 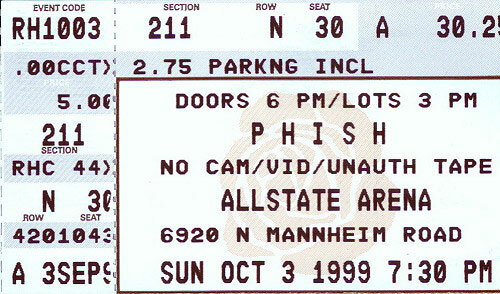 Celebrate whatever tickets you get with one of the most exciting Phish sets of ’99. Only two words needed here– “Bag,” and “Gumbo.” Enjoy the weekend! This entry was posted	on Friday, January 30th, 2009 at 4:14 am	and is filed under Uncategorized. You can follow any responses to this entry through the RSS 2.0 feed. Both comments and pings are currently closed. Way to go Harpua77! Happy Birthday! it is possible i got 3 tickets to knoxville. what a better way than thru livehation. 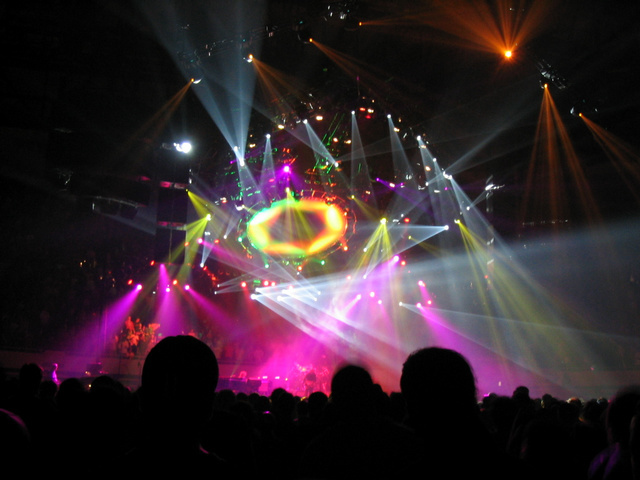 phish ought in future to release tickets for all different shows on different dates. that could help. Harpua77 you my first show will be great woods/comcast center. Also, to go along with your birthday story it is my fake ID’s birthday today. If anyone has extra Mansfield…. I will offer my collection of David Hasselhoff’s Greatest hits sung in German!! I got 4 alpine (first nite) looking to trade for NJ.. I ended up in front of my computer for 2 hours and 15 minutes on Friday to get tickets to the Pittsburgh show and continuously calling the 800# with no luck… the ticket freak out was definitely ON! It all ended well with pavilion seats! I was cursing that damn computer for longer than I care to remember – I even had co-workers on the project for me with no luck! I would get all the way to where I had to put in my info and it would TIME OUT! 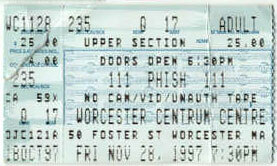 I was at that Worcester show – 1997 and 98 – I remember the Rocky Top first set closer well. I got those tix on the phone from Ticketmaster because I lied to the agent at first and told her I was calling for Patriot tickets and had her check out multiple games and then finally asked for Phish at 10am. Powered by WordPress v 5.1.1. Page in 0.604 seconds.